Ostrya virginiana mature fruit. 827987. 2006 © Peter M. Dziuk. Minnesota Wildflowers. minnesotawildflowers.info (Accessed 7/2017). 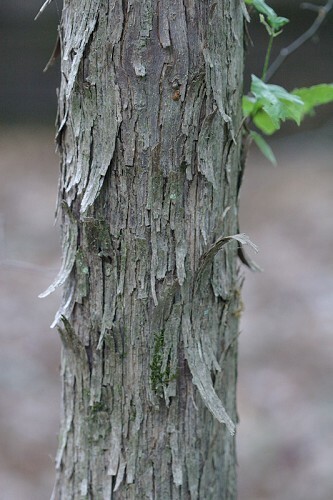 Ostrya virginiana is a tree to 20 m tall; bark brown, shaggy. Leaves alternate, elm-like, veins pinnate, deeply impressed, margin sharply toothed. Ostrya virginiana male catkins (open). Jeff D Hansen. Kansas Native Plants. kansasnativeplants.com (Accessed 7/2017). 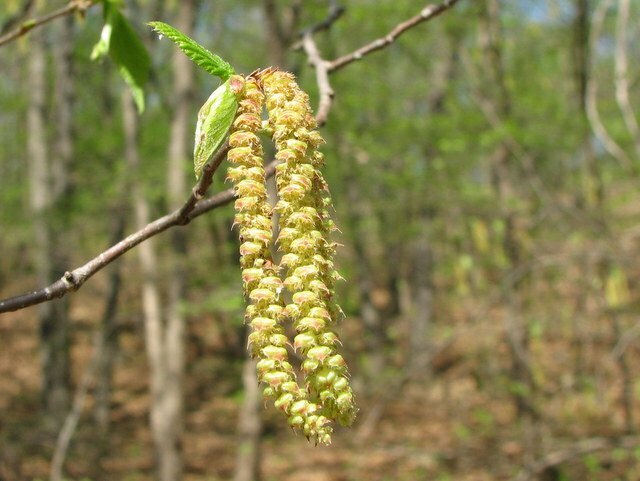 Flowers monoecious, male in catkins, female in small clusters April-May, wind pollinated. 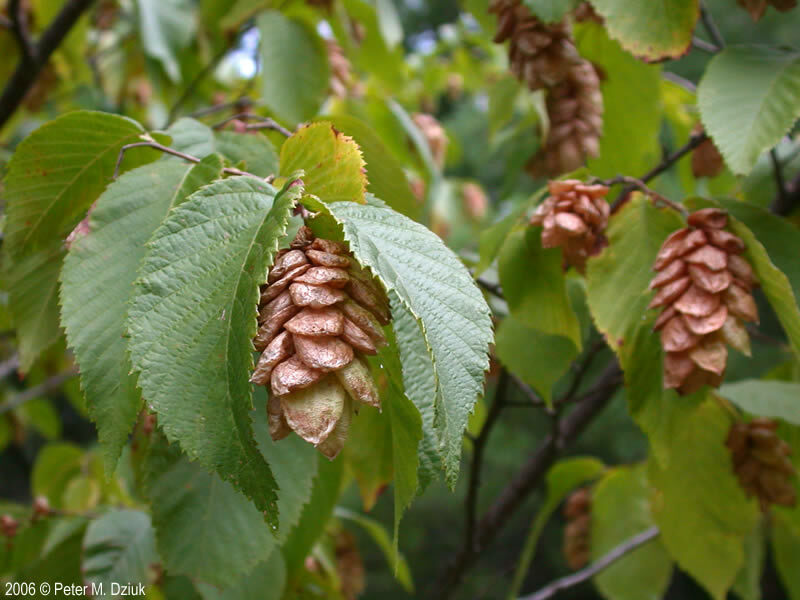 Fruit is a nutlet, about 0.5 cm, surrounded by bracts, enclosed in an inflated sac about 2 cm, Sept., dispersed by wind through fall and winter. Seeds eaten by birds and small mammals. Seeds must overwinter to germinate, able to reproduce under closed canopy or old fields. 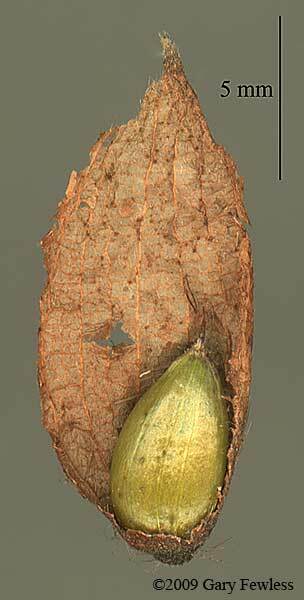 Ostrya virginiana seed with half of fruit sac. © 2009 Gary Fewless. University of Wisconsin Green Bay, Herbarium, Cofrin Center for Biodiversity. uwbg.edu (Accessed 7/2017). Habitat: Undisturbed forests. Grows well on limestone derived soils relatively high in calcium, magnesium, pH, silt and clay (Balter and Loeb 1983).Tolerates soil pH 4.2-8. Very shade tolerant, index 8-10. Moderately tolerant of drought. Intolerant of flooding, soil compaction, salt, sensitive to air pollution (Hightshoe 1988; USDA, NRCS 2010). Ostrya virginiana_2287_500 bark. Southestern Flora. southeasternflora.com (Accessed 7/2017). Notes: Stump sprouts when cut, resprouts after light fire. Attacked by a few fungi, such as the white rot Phellinus igniarius (Sinclair et al. 1987; Burns and Honkala 1990).